A few days back, I decided to take advantage of summer’s gift by buying a couple of pounds of red chilies from the farmer’s market. 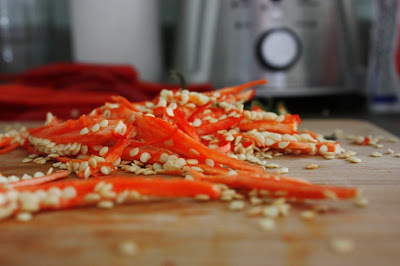 I am going to make a very staple condiment that is true to my Penang roots, Sambal Belachan. 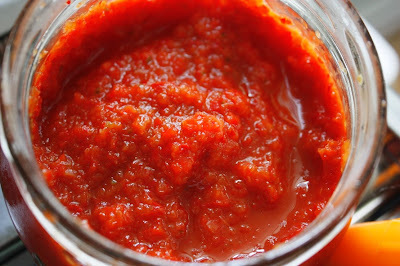 Sambal Belachan is a type of spicy chili chutney made from fresh red chilies (of any kind), toasted belachan (shrimp paste) and several other flavor adjustments to suit one’s taste. My late grandmother used to always have some in store in her house everyday and if there was none left, you can definitely be hearing her pounding on her stone mortar and pestle for some before dinner time. 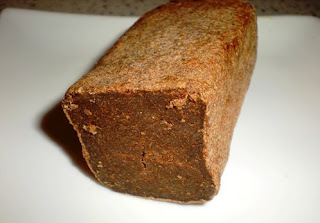 It is a family favorite that goes with pretty much everything in every meal. 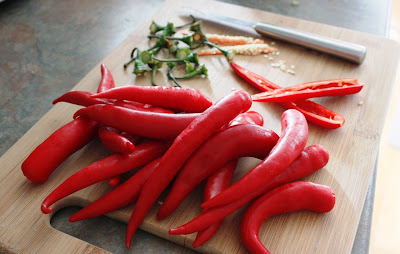 So, for the first time since I moved to Montreal, I am finally making my own sambal. No more craving for it and getting half-assed bottled ones that doesn’t taste like how I want it to taste. No more, I am going to make my own; and enough to last me whole autumn and winter! I am not sure how much fresh chili I bought. I went to the farmer’s market, scoped around and saw a stall selling four small 4″x6″ crates and bought all of it for $2 each crate. I would say I had about approx. 1.5kg of red chilies? It’s a lot of chilies. 1. Put all the ingredients into the food processor and blitz until it is well blended. 2. Adjust your sambal belachan to taste, adding more salt or more sugar or more lime for a perfect balance of all three without overshadowing the belachan flavor. 3. Transfer the sambal into an air tight container. It will keep well for months, if stored properly. While traditionally, the ingredients above are pounded in a stone mortar and pestle, I used a food processor instead. Texture wise, it did change a little bit because using a food processor makes for a more watery sambal belachan while a mortar & pestle smashes and grinds the chilies into a thicker paste. I prefer the mortar and pestle version, of course but I do not have one so the food processor it is. I think I need to explain the difference between belachan and har kou. No doubt, both uses the same ingredients, shrimps, but one is completely different from the other. One is a dried paste, formed into a block of various shapes and sizes (Belachan) and the other is a paste that is more like a thick, viscous sauce and rather tastes like shrimpy molasses (Shrimp Paste/Hae Ko/ Har Kou). You can read the differences between the shrimp pastes in wikipedia:shrimp paste. We used the Belachan sort of shrimp paste (or should I say shrimp block) in the Sambal, not the thick saucy kind of shrimp paste used in Penang Assam Laksa or in Fruit Rojaks. Oooh! I just saw the making of a sambal (forget which type) on _Food Safari_. Bookmarked/clipped! Looks a bit watery, it should be a bit more chunkier. That looks good. 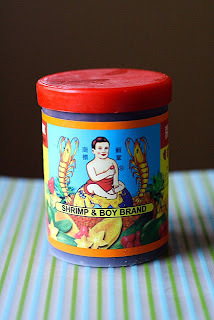 I only have the Hong Kong style shrimp paste that comes in a jar. Do you think I can substitute? judyfoodie: I have never seen hong kong style shrimp paste before so I cannot really tell you if it would be a good substitute. Is the paste wet? According to wikipedia, it’s just another version of shrimp paste. I think the hk-style shimp paste should be fine. It’s not as dry as the belacan blocks but definitely not as wet as hae ko. Props to you for making sambal belacan! Time to find some ong choy or eggplants! oh! 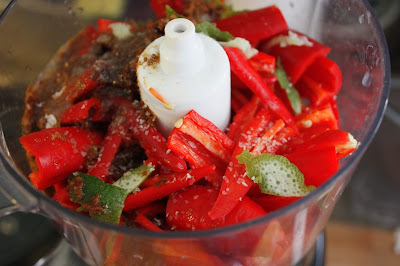 your sambal look so red and good!must be very spicy.. you so hard working deseed the chili..me no,just dump everything in the blender!lol!